The David and Goliath Play. Jewish folk-comedies, written for performance in Jewish family circles or before a Jewish public during the month of Adar, especially on Purim. While in general a dramatic performance was considered frivolous, an exception was made with regard to Purim. Even in the Talmud mention is made of certain spectacular entertainments and buffooneries, which must have been very common on Purim (see Sanh. 64b; Meg. 7b). In geonic times the dramatization of the story of Esther was a well-established custom among the Jews of the Orient. The central figure of these plays was a dummy representing Haman, which was burned while the spectators were jesting and singing. Similar amusements are reported of the Jews of other countries during the Middle Ages, and they may be seen in some countries even today (see Purim; comp. Güdemann, "Gesch." iii. 211 et seq. ; Löw, "Lebensalter," p. 296). 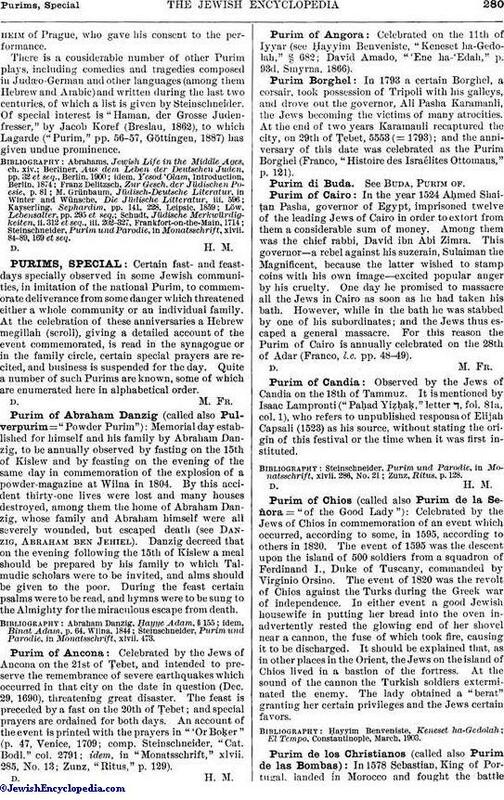 The real Purim play, however, the Judæo-German "Purimspiele," did not make its appearance until the first decade of the eighteenth century. There were, it is true, some dramatic productions on the subject of the Book of Esther and the Feast of Purim long before that time, as the drama "Esther," by Solomon Usque and Lazaro Gratiano (1567)—the first Spanish drama written by a Jew (comp. Kayserling, "Sephardim," p. 141; Berliner, "Yesod 'Olam," p. xiii. ; Löw, l.c. p. 298)—and the "Comedia Famosa de Aman y Mordechay" (Leyden, 1699), by an anonymous author, probably the noted Spanish poet Antonio Enriquez Gomez (comp. Kayserling, l.c. pp. 228, 350; Steinschneider, in "Monatsschrift," xlvii. 170); but these dramas were probably intended for the general stage, since there is no record that they were ever Performed by the Jews. According to information drawn from a satirical poem written in Judæo-German in 1598, it appears that a Purim play entitled "Spil von Tab Jäklein mit Sein Weib," etc., was acted "every Purim" at Tannhausen in the sixteenth century. No trace of this play exists, and possibly it was never printed (see Steinschneider, l.c.). Therefore as the first Purim plays intended for and actually performed on the stage during the days of Purim must be considered the two Judæo-German dramas, if they really deserve this name, described by Schudt in his "Jüdische Merkwürdigkeiten" (ii. 314-317). One of these bears the title "Aḥashwerosh-Spiel," and was published anonymously at Frankfort-on-the-Main in 1708 (later reprinted in Schudt, l.c. ii. 202-226). A specimen in English translation will be found in Abrahams' "Jewish Life in the Middle Ages" (p. 265). This comedy does not reveal any literary value; its language is very often frivolous and was justly criticized by Schudt (l.c. ii. 316), and later by S. L. Rapoport in his Hebrew Purim drama "She'erit Yehudah" (Vienna, 1827). Indeed, the Jewish authorities at Frankfort-on-the-Main, where it was performed several times, have forbidden its performance and confiscated and burned all obtainable copies (Schudt, l.c. ; Berliner, l.c. p. xv.). The other play, written by Baermann of Limburg, bears the title "Mekirat Yosef," its theme being the story of Joseph and his brethren. It was published at Frankfort by Löb Ginzburg before 1711 (not, as Steinschneider, following Wolf, says, l.c. xlvii. 88, in 1712). Schudt (l.c. ii. 314) reports that all the copies of this first edition were burned in the great conflagration of the Frankfort ghetto in 1711, and that another edition was prepared there in 1713. The matter is of some importance, as all the bibliographers differ on that point (comp. Berliner, l.c.). The play was published in a third edition by Schudt (l.c. iii. 226-327), with a German translation. It must have been performed at Frankfort and Metz several years before 1711 (Schudt, l.c. ii. 314). The actors in both places were Jewish students of Prague and Hamburg, with the above-mentioned Baermann of Limburg as their theatrical manager. The play excited great interest, and two soldiers were required to keep back the crowd; but when Christians also began to flock to the play, the performance was prohibited (Schudt, l.c.). It should be said that this comedy, although on the whole of no literary or artistic value, is far superior to the "Aḥashwerosh-Spiel," both in moral tone and in diction. The only frivolous character in this play is the clown named Pickelhäring (comp. Schudt, l.c. iii. 305), who is not a Jewish invention, but is taken from the German drama (Abrahams, l.c. p. 264). This comedy became very popular among the Jews, and was performed in Minsk as late as 1858 (Steinschneider, l.c. xlvii. 88); probably it is still acted in eastern Europe. In this connection should be mentioned a Purim play which was performed at Frankfort, alternately with the "Mekirat Yosef," during the whole month of Adar, and whose subject was the story of David and Goliath. This comedy is probably identical with the one quoted by Steinschneider (l.c. xlvii. 87) under the title "Aktion von König David und Goliath" (n.d., n.p.). If this is so, its first publication should be placed between 1714 and 1719, as it had not yet been printed when Schudt, who published his "Jüdische Merkwürdigkeiten" in 1714, reported its performance (ii. 314). Another play which calls for special mention is one in Judæo-German, which was performed in 1720 at Prague, where it was published anonymously (in the same year) under the title "Akta Esther mit 'Achaschwerosch" (later edition, Amsterdam, 1774). This comedy differs very favorably from the plays described above, in both its dramatic composition and ethical tendency (comp. Berliner, l.c.). On the title-page of the play it is asserted that "it was acted at Prague in a regular theater, with trumpets and other musical instruments" (comp. Roest, "Cat. Rosenthal. Bibl." i. 67 [Hebr. part, ii., No. 171]). The actors were all pupils of R. David Oppenheimof Prague, who gave his consent to the performance. 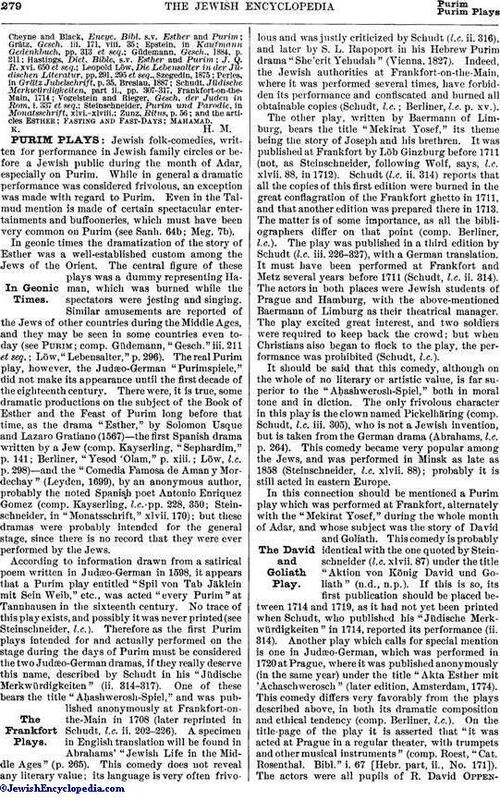 There is a considerable number of other Purim plays, including comedies and tragedies composed in Judæo-German and other languages (among them Hebrew and Arabic) and written during the last two centuries, of which a list is given by Steinschneider. Of special interest is "Haman, der Grosse Judenfresser," by Jacob Koref (Breslau, 1862), to which Lagarde ("Purim," pp. 56-57, Göttingen, 1887) has given undue prominence. Steinschneider, Purim und Parodie, in Monatsschrift, xlvii. 84-89, 169 et seq.